Athletes’ day begins at 9 o’clock in Burano for the qualification race, and there will be three heat for men and three for women - 15 runners from each heat qualify for the finals. These will be real sprint races in the most famous city and in this ‘natural’ labyrinth for orienteers. 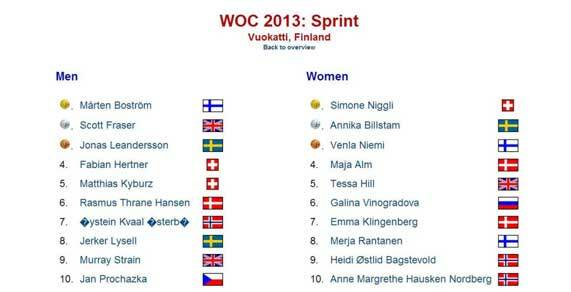 The first final in this year World Championships is the sprint final which starts Saturday afternoon at 15:20 CEST. Men course will be 4.80 km long with 22 control points and 15 minutes of estimated winning time; for women 4.35 km with 20 controls and 16 minutes of estimated winning time. Mårten Boström won a very popular Gold medal on home ground (World Championships in Vuokatti, Finland) literally running away from his competitors with higher running speed on the longer legs. In the women’s class Simone Niggli took an expected gold medal – but Annika Billstam got very close in the end after a non-optimal route choice by Niggli. To test your own tune in Venice, Venice Summer Race (5 Days of Italy prologue) gives you a spectacular opportunity. One can participate 10.30-12.30 o’clock with punching start; the event centre will be as usual in Arsenale area.